Cloud brokerage is an enabling technology allowing various services to be merged together for providing optimum quality of service for the end-users. Within this collection of composed services, testing is a challenging task which brokers have to take on to ensure quality of service. Most Software-as-a-Service (SaaS) testing has focused on high-level test generation from the functional specification of individual services, with little research into how to achieve sufficient test coverage of composite services. This paper explores the use of model-based testing to achieve testing of composite services, when two individual web services are tested and combined. Two example web services – a login service and a simple shopping service – are combined to give a more realistic shopping cart service. This paper focuses on the test coverage required for testing the component services individually and their composition. 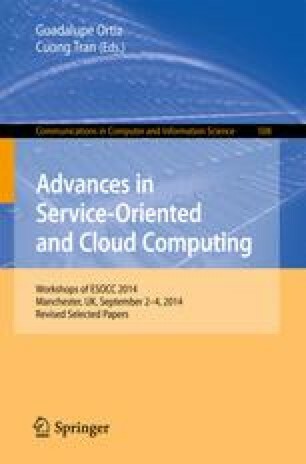 The paper highlights the problems of service composition testing, requiring a reworking of the combined specification and regeneration of the tests, rather than a simple composition of the test suites; and concludes by arguing that more work needs to be done in this area. The research leading to these results has received funding from the European Union Seventh Framework Programme (FP7/2007-2013) under grant agreement no. 328392, the Broker@Cloud project (http://www.broker-cloud.eu).